The season for Mt. Fuji climbing started on July 1st. Originally, it started on the 1st day of the 6th month in the lunar calendar. Mt. Fuji, the highest peak in Japan, is 3,776 meters in height. It is classified as an active volcano now. In ancient Japan, the mountains such as Mt. Fuji or The Dewa Sanzan (出羽三山:Three Mountains of Dewa) were worshipped as Shinto gods. So two shrines near the mountain perform a ritual on this day. Now climbing Mt. Fuji is a leisure activity for most people. Some climbers caught the sunrise from the summit of Mount Fuji. It is on the border between Yamanashi and Shizuoka Prefectures, but it's free from boundaries near the mountain's summit. The Edo Shogunate donated its entire top from the 8th stage upwards to The Fujisan Hongu Sengen Taisha (富士山本宮浅間大社) in 1779. The national government claimed title to the land, but the Supreme Court recognized the land as the shrine's grounds in 1974. In the Edo Period, it was not easy for many worshippers to climb Mt. Fuji, so they simulated a pilgrimage to it by builing miniatures of Mt. Fuji with lava from it. 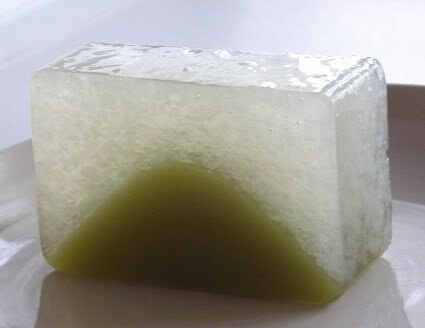 This confection presents lingering snow and a green mountain in summer. I received it as a gift in return for a funeral offering. Hakata Gion Yamakasa(博多祇園山笠）is the festival held by Kushida Shrine(櫛田神社) from July 1st to 15th at Fukuoka City in the Fukuoka Prefecture. The highlight of the festival is Oiyama(追い山) that nearly-naked men swiftly draw decorated floats on the 15th. Steamed buns with beans paste filling named Gion-manju(祇園饅頭) are available for a limited time from July 1st to 14th and are made by only three confectionery makers. The buns include sake lees. They are wrapped with film on which the shrine crest is printed and the shrine drives away the ill luck of the buns. People in Hakata eat them after offering them at household altars to wish for the safety of the festival. Steamed buns including sake lees and with beans paste filling. It looks like an ordinary steamed buns with beans paste filling. Usually, we eat this in winter. Enni(円爾,1202-1280) was a Japanese Buddhist monk who studied in China. His posthumous name was Shoichi Kokushi(聖一国師). It is said that Enni gave a teahouse's shop owner at Hakata a recipe for making a sake-manju and named the shop "Toraya" in 1241. Sake-manju is also called Toraya-manju. It is unclear whether the shop is the same as the famous "TORAYA", but the nameboard TORAYA owns is said to have been written by him. In the Edo Period, it was customary for the Kaga Domain(now Ishikawa Prefecture) to make shoguns presents of ice on the 1st day of the 6th month in the lunar calendar. Now people living around Kanazawa City of Ishikawa Prefecture eat steamed buns with bean paste filling named Himuro-manju(氷室饅頭) on July 1st. This is different from Himuro-manju around Kanazawa City. This is a pudding-like cake using arrowroot starch and it's topped with a red triangle representing ice.